ADJ continues to push the boundaries of LED technology with the Inno Beam LED, a compact intelligent Moving Head with a bright 80W LED source. It produces a tight 6-degree beam projecting 8 colors plus white. It features a laser cut GOBO Wheel with 4 GOBOs and 4 Beam Reducers to change the size of your beam (for exciting effects and for pinspotting), an 8-facet prism and a Frost filter to create a wash effect. The Inno Beam LED is lightweight and small in size making it extremely mobile for easy set-up and transport. It may be controlled via DMX, Sound Activation (with it’s own 4 built-in shows) or from the ADJ UC3 easy-to-use controller. It has a Pan/Tilt Inversion mode that makes the heads produce contrasting movements. There are 2 DMX channel modes (12 or 14 channels). The Inno Beam LED has 5 selectable dimming curves, a high speed shutter for slow to fast strobing and pulsing, and has a low power draw of 129W at maximum. 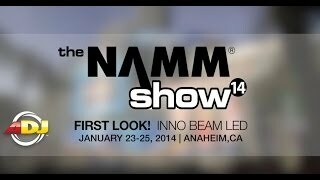 Considering purchasing the American DJ Inno Beam LED? Have questions? Ask people who've recently bought one. Do you own the American DJ Inno Beam LED? Why not write a review based on your experience with it. A really cool beam effect from ADJ. A really bright, sharp quad led which will punch well through any atmospheric effects. Very quick moving and would work great for any fast moving shows!! Very good!!! Seen a video for American DJ Inno Beam LED online or have you own video? You will earn 1,218 loyalty points with this product worth £3.05, when logged in. 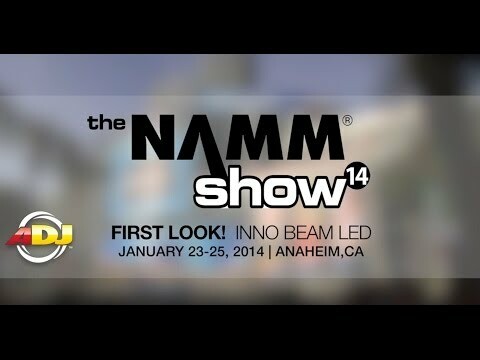 Check out American DJ Inno Beam LED on DJkit.com!